Gold prices rose Monday, but again modestly. In the six sessions since the precious metal ended down at $1,572.30 an ounce on March 1, it has climbed slightly five times and settled flat once. Gold for April delivery tipped higher by $1.10, or less than 0.1%, to close at $1,578.00 an ounce on the Comex in New York. Prices traded between $1,574.50 and $1,582.50. "Gold prices ended the U.S. day session slightly higher in subdued dealings Monday," Jim Wyckoff said in the PM Kitco Metals Roundup. He added that "some mild short covering and bargain hunting were featured. However, the still-weak near-term technical posture of gold and silver is limiting trader and investor buying interest in both." Last week gold added $4.60, or 0.3%, to snap a four-week losing streak. Silver futures declined for the first time in seven sessions. Silver for May delivery lost 9.5 cents, or 0.3% to settle at $28.853 an ounce. Prices ranged from a low of $28.705 to a high of $29.085. Like gold, gains in the previous sessions were modest. They did stack up to 45.8 cents last week. April platinum fell $2.70, or 0.2%, to $1,601.20 an ounce, trading between $1,594.70 and $1,608.30. Platinum last week surged $30.40, or 1.9%. Palladium for June delivery declined $3.55, or 0.5%, to $779.20 an ounce, ranging from $770.35 to $784.65. Palladium soared $62.35, or 8.7%, last week. Last week in London, gold declined 50 cents, silver rose 2.7%, platinum added 0.6% and palladium gained 6.7%. U.S. Mint bullion sales increased Monday for American Eagle gold and silver coins. 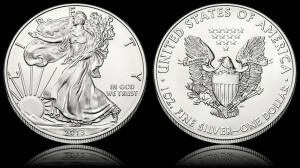 In a significant milestone, American Silver Eagle bullion coins advanced 665,500 to 12,429,000 for the year. Silver Eagles above 12 million a year in sales is common place now, having happened annually since 2008. But before then, it had never occurred… and the series started in 1986. Further, the milestone has never been hit so early into a year. Last year at this point the Silver Eagles had reached 8,662,000. In 2011, which holds the all-time annual Silver Eagle sales record at above 39.8 million, the coins were at 10,379,000 by March 11. Current U.S. Mint bullion coin sales follow.